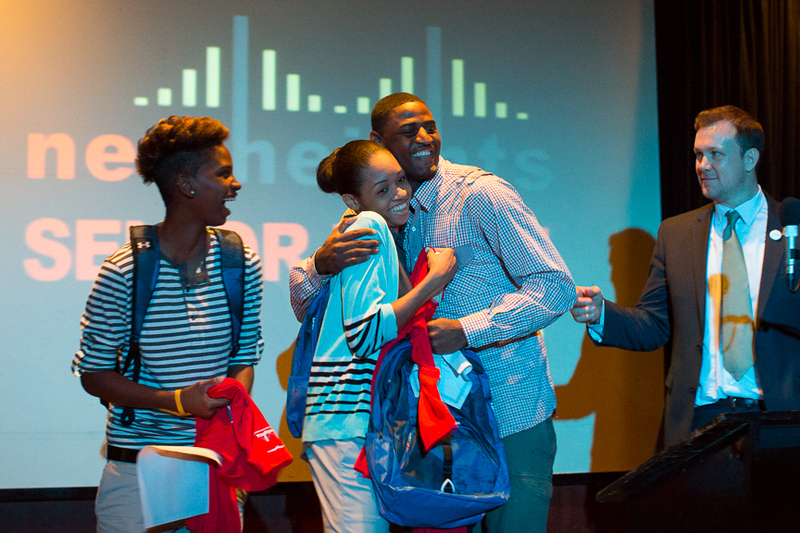 On June 3, New Heights celebrated its 27 graduating seniors at our 5th annual High School Senior Night. The event took place at B.B. King Blues Club & Grill in Times Square. The event was a wonderful celebration of our graduating student-athletes, which included families, staff and many New Heights supporters who were in attendance. The night was highlighted by senior speaker Maria Backman (University of Michigan, Class of 2018) and guest speaker, NBA player and NCAA champion, Emeka Okafor. Maria, a member of New Heights since middle school, spoke about the doors that New Heights opened for her and shared some of her memories of the program. When it was Okafor’s turn to speak, he imparted an inspirational message to the seniors, sharing with them the importance of not forgetting where you come from, never thinking that you’re too good for anything, and always working hard. “There are going to be certain situations in your life that you may think are above you or too hard”, Okafor said. “But you have to remember, I can handle this. Why? Because you’re doing it now, you've done it.” The seniors were thrilled to listen to him and get the opportunity to meet and take pictures with him. New Heights is so proud of these 27 young men and women. Once again, 100% of our senior class graduated high school, and that is a testament to their hard work and perseverance. Congratulations to the Class of 2014! The future is bright for this special group. Wednesday, April 16th was an exciting day for two of our New Heights seniors, Chris Robinson and Nathan Ekwu. The Cardinal Hayes stars signed their college commitment letters in a front of a gathering of family, coaches, school administrators and media. The excitement on Chris and Nathan’s faces was evident as they officially made their dream of playing Division I Basketball a reality. Chris committed to Sacred Heart University in Fairfield, Connecticut and Nathan to Davidson College in Davidson, North Carolina. Both will be receiving full rides. Chris and Nathan are the 18th and 19th members of the New Heights graduating class to receive full college scholarships. Other graduating student-athletes will attend great schools such as Fordham University, George Washington University, The University of Michigan and Yale University. On Saturday, April 19th at the Harlem PAL, the girls were thrilled to see the WNBA star in person and to get a chance to talk with her about a variety of subjects. Essence spoke to the girls about work ethic and perseverance, driving her point home with a story about her comeback from a bad knee injury. She also talked about being cognizant of how you represent yourself, in that wherever you go you represent your school and New Heights. She touched on the importance of utilizing social media for positive purposes, warning against the negative exposure that can occur when inappropriate content is posted in a public forum. The event was informative and exciting for the girls. ONLY 4 spots remain for individuals to run the 2014 TCS NYC Marathon in support of New Heights! Seize the opportunity to train yourself into fantastic shape and compete in the historic marathon, while raising money to support over 200 NYC student-athletes. For more information and to sign up click here. Our biggest annual fundraiser, MADNESS, took place on March 13th and it was a big success. Over 400 friends and guests gathered at The Ainsworth on March 13th in support of New Heights. Everyone in attendance was a champion for New Heights and this year’s honorees, raising over $650,000 for New Heights’ student-athletes and programs. If you didn't get a chance to already, check out the photos from the event here or click on the pictures below. We thank those who contributed to this wonderful celebration of our work and we are very grateful for your continuing support of our student-athletes. Recently, New Heights partnered with the New York Knicks and the Harlem PAL to host a clinic for 50 middle school boys and girls. Tim Hardaway Jr., Cole Aldrich, Jeremy Tyler and Toure Murray shared their life experiences with the student-athletes and how they achieved their goals of making it to the NBA through school and hard work. The four professional athletes then led and participated in a series of drills with our student-athletes. A good time was had by all.